Imagine letting your body do the work for you. You no longer need to cut down your portions or spend countless hours in the gym to lose weight. Because Tiny and Full is not a diet--it's a revolutionary lifestyle, where you will discover how to eat MORE and still lose weight. Scientists and researchers have discovered "tiny calorie foods," or foods low in calorie but big in size, that can help you stay TINY but FULL. These foods allow you to turn off hunger by filling up and staying satisfied while cutting calories. Paired with more than 80 delicious recipes--everything from pizza to ice cream, a 12-week easy-to-follow meal planner, shopping lists, and at-home workouts too--you have all the tools you need to reach your weight-loss goals. This special edition of Tiny and Full now includes a brand-new, gluten-free Thyroid Boost meal planner designed to heal and boost your thyroid to its highest potential. The Thyroid Boost meal planner and recipes will help you overcome chronic fatigue, weight-loss plateaus, constipation, weight gain, and other thyroid issues and symptoms. Jorge Cruise is a leading fitness and nutrition expert and the #1 bestselling author of more than 20 books in 16 languages. His passion for health and fitness is shown on his Facebook Live show, Tiny Talks, with over 2 million viewers as well as the E television series Revenge Body with Khloe Kardashian where he trains and transforms Khloe's favorite underdogs. 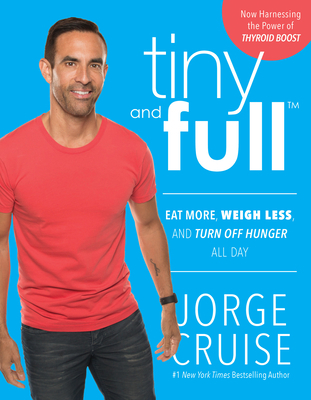 Jorge Cruise is internationally recognized as a leading celebrity fitness trainer and is the #1 bestselling author of over 20 books in 16 languages, with more than six million books in print. He is a contributor to The Steve Harvey Show, The Dr. Oz Show, Extra TV, Good Morning America, TODAY, The Rachael Ray Show, The Huffington Post, First for Women magazine, and The Costco Connection. Jorge received his Bachelor's degree from the University of California, San Diego (UCSD); fitness credentials from the Cooper Institute for Aerobics Research, the American College of Sports Medicine (ACSM), and the American Council on Exercise (ACE). His career was launched on The Oprah Winfrey Show in November, 1998. From there, he was featured in Oprah's Magazine in the January 2005 issue and featured again in her book, O's Guide to Life. Celebrities who have since followed Jorge's diet plans include Angelina Jolie, Jennifer Lopez, Lucy Liu, Kyle Richards, Eva Longoria, and most recently, Steve Harvey.